Our product is registered with the State of Louisiana as a “Certified Cajun” product of Louisiana. Frey Sausage has and will always be manufactured utilizing lean, premium 100% pork and a unique blend of true Cajun spices with NO FILLERS ADDED. Frey Smoked Sausage, LLC (Frey Sausage), a small family owned business, officially began in July 2007 in Mowata, Louisiana. The founders of Frey Sausage, Ralph and Charlotte Frey, have enjoyed and shared this unique sausage recipe with family members for many years. The original Frey Sausage recipe was created by Ralph’s father, Winston, in the early to mid 1900's. Winston utilized a combination of his German heritage and the unparalleled true Cajun culture to formulate a spectacular Cajun sausage recipe known today as Frey Sausage. 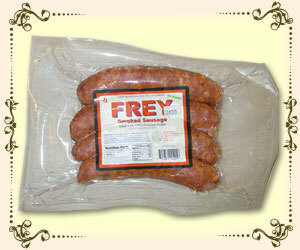 For years, the family gathered together, two or three times during the winter, to make a batch of Frey Sausage. After receiving an overwhelming response from extended family and friends, Ralph, Charlotte, and their children and spouses decided to market Frey Sausage through a small scale retail venture. Due to the gradual success of the retail business, we, the Frey Family, wanted to broaden our expectations of this desired product by attempting to enter the wholesale market (grocery stores and food service). In doing so, Frey Sausage realized that a USDA approval would be needed. 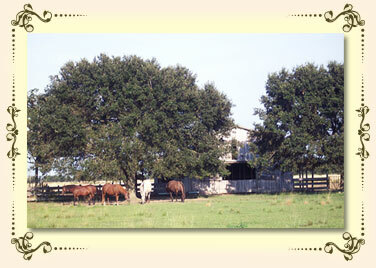 In early 2009, our product received final approval from the USDA!! The combination of our German and Cajun heritage, which includes strong family values and a hard work ethic, has proven to be a major part of the continued success of Frey Sausage. We hope you take the opportunity to sample Frey Sausage, which has delighted so many of our family members and friends over the years.